How to apply for TS SC Study Circle Free Coaching Entrance Exam 2019 for Bank Exams, Foundation Course: Telangana State Scheduled Castes Study Circle (Sponsored by Scheduled Castes Development Department, Govt. 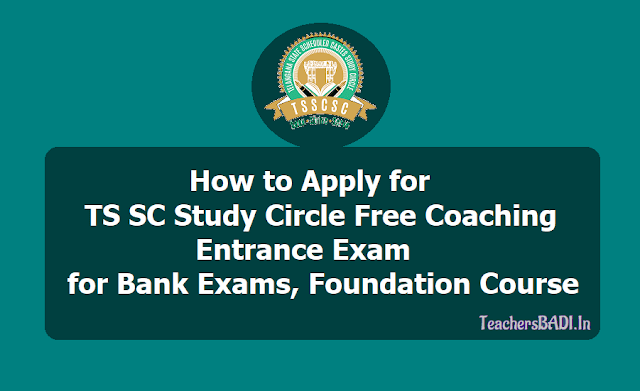 of Telangana) has issued the TS SC Study Circle Free Coaching Entrance Exam 2019 notification and two separate online applications are invited from the eligible and interested candidates for admission into 3 months two different free coaching programmes. Second one for Banking Services at (2) TSSC Study Circle branches namely Karimnagar and Suryapet Districts through Telangana State Scheduled Castes Study Circle, Hyderabad, to SC, ST, BC and Minority candidates, for (100) candidates of Telangana State. 1.Candidate should opt only one coaching programme otherwise his/her application will be summarily rejected. 2. While filling up the form you will be asked to upload your passport sized photograph and your scanned signature both in JPEG/PNG format and certificates/documents should be upload PDF format only. 3. The size of the individual files for photo,signature and certificates / documents should not exceed 1000 Kb each. 4. Please use black ball pen for the signature which is to be scanned for uploading.You are strictly advised to retain an identical photograph, to be pasted on the admit card, in case it is not printed on the admit card. 5. Please re-visit the site for downloading your Hall ticket / Admit Card one week before the entrance test i.e. , 17th February 2019. 6. All fields are mandatory. 3. Copy of latest Income Certificate for the financial year 2018-19 issued by MRO which is in force. For free coaching, online applications are invited from eligible candidates of Telangana State from 21.01.2019 in the website “www.tsscstudycircle.telangana.gov.in” and the last date for receipt of online applications is 10.02.2019. Candidates can download their hall tickets from 12.02.2019. The coaching programme will be organized from 27.02.2019 to 26.05.2019, in the aforesaid respective districts only. The students should be prepared to join only in the aforesaid mentioned Districts according to their choice of course.